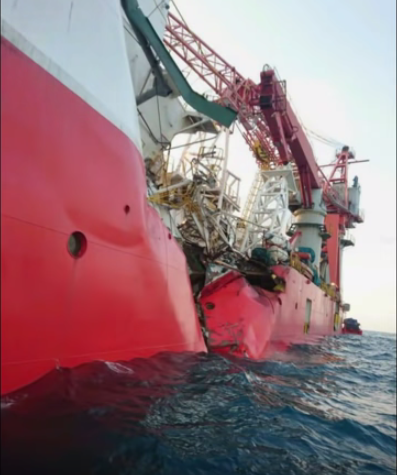 Chemical tanker Antea collided with an undersea cable and pipe-laying ship MV Star Centurion, causing the latter to capsize in the Indonesian Waters some 10 nautical miles north of Berakit, Bintan island, eastern Singapore Strait waters on June 13. Chemical tanker Antea left Singapore early in the morning Jan 13 en route to Ambon, Indonesia. The 40,000-deadweight-tonne oil product tanker was steaming past the Centurion, a 13,000-deadweight-tonne ship that specializes in laying cables and pipes on the ocean floor. The Centurion was anchored in the Horsburgh OPL zone, an area in which ships take on marine fuel, on the eastern edge of the Singapore Straits since January 7. 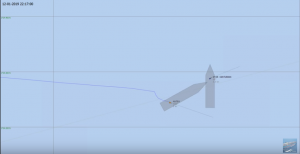 This was according to the shipping data of Refinitiv Eikon and MarineTraffic AIS data. The Indonesian Navy had deployed several vessels to the collision site. The pipe-laying vessel had a hole punctured in its side from the accident with massive water ingress, causing it to severely tilt. According to Samsul Nizar, the head of operations at the Indonesian coast guard base at Tanjung Uban on Bintan, “It’s already capsized but it hasn’t sunk completely.” Star Centurion remained submerged, but still afloat. The 22 persons on board the Vanuatu-flagged vessel Centurion, abandoned the ship on a lifeboat and were rescued after. Maritime and Port Authority of Singapore (MPA) spokesman informed that “they will be repatriated home by the vessel owner.” There were no fatalities reported. No pollution was reported either. The 2002-built Hong-Kong flagged chemical tanker Antea sustained a damaged bow and forecastle. Antea’s registered owner is Pertamina of Indonesia and managed by Bernhard Schulte Shipmanagement (BSM) according to Equasis. MV Star Centurion, formerly named Lewek Centurion, was previously owned by Singapore’s Ezra Holdings but DBS Bank repossessed the vessel some time back. It is being managed for the bank by Vallianz Offshore Marine. The Singapore Strait is one of the busiest commercial routes in the world where hundreds of container ships, oil and fuel tankers and dry bulk carriers daily traversing the waters that connect east Asia to Europe, India and Africa. Every year, there are about 130,000 vessel calls at the Port of Singapore, that means a vessel arriving or leaving every two to three minutes. With its port infrastructure at Tuas mega port, it is a major milestone in Singapore’s next generation container terminal development in four phases. Phase 1 construction began in April last year, is slated to open progressively from 2021, while Phase 4 is targeted to open 2040. “Navigating the lane becomes even more challenging when visibility is low. At its narrowest, ships are sometimes separated by just under one nautical mile or about 1.85km,” he added. In 2016, MPA released The Safe Passage in the Singapore Strait package containing videos and computer-based learning programmes. This was distributed free to shipping firms, providing information about navigating the congested shipping lane. It was produced jointly with the maritime authorities of Indonesia and Malaysia. But accidents at sea could never be avoided, especially in the worlds leading maritime hub. On December 25 last year, deck cargo ship Amanda capsized and sank some 3 nautical miles east of Tanjung Sepang, Malaysia, eastern Singapore Strait. The 2400-deadweight-tonne cargo ship suffered steering failure, went out of control, collided with another ship at anchorage, capsized and sank. Of 9 Bangladeshi and Chinese crew, 6 people were rescued, 3 went missing. The Palau-flagged Amanda was built 2010 and managed by O&F Marine SDN BHD, Johor, Malaysia. 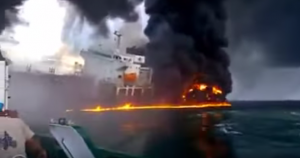 Ten days before Christmas, Dec 15, 2018, fire erupted on board of general cargo ship Aventador, when one of the generators exploded, which spread around superstructure. Tugs and firefighters were deployed and the fire was extinguished. The 5 crew on board were safe. The Mongolia-flagged 1986-built Aventador was anchored at Batu Ampar, Batam Island, Indonesia, Singapore Strait since July. It was managed by Lhs Stevedoring & Trading Singapore. On April 17, 2018, Aframax crude oil tanker Astro Saturn collided with LPG tanker Crystal Sunrise in Singapore Strait near Jurong Island, Singapore. Astro Saturn was proceeding in the western direction, LPG tanker Crystal Sunrise was heading in opposite direction approaching Singapore, with a cargo of LPG loaded in Qatar. After the collision, Astro Saturn, with a cargo of fuel oil, was brought to anchor in Malaysian waters off Pulau Kukup island. LPG tanker Crystal Sunrise probably was anchored for some time near collision site. There were no harmful leaks reported. Maritime investigations reported that part of Singapore-flagged 2013-built Crystal Sunrise cargo estimated 1,796 metric tons of butane gas had leaked. Liquid butane has a high evaporation rate, leaked butane was drifting in the southern direction away from Singapore, posing no risk. On the other hand, Greek-flagged 2003-built Astro Saturn suffered portside bow and damages. Astro Saturn is managed by Pantheon Tankers while Crystal Sunrise is managed by Kumiai Navigation Pte Ltd.